Eurasia Group’s Ian Bremmer says that 2018 is “by far the greatest geopolitical risk environment that we’ve ever seen" and that this could be the year where the international community witnesses the geopolitical equivalent to the financial crisis. Put simply, this means the decline of U.S. influence in the world will accelerate in 2018, as the US’s mix of soft power and economic and political liberalism faces a crisis of credibility. Meanwhile, some of the U.S.’s largest geopolitical rivals will seek to claim some of the authority ceded by the “America First” Trump administration, which is opposed to trade deals, supports slashing funding for the United Nations and is virulently anti-immigration. Bremmer believes Xi Jinping’s speech at November’s Nineteenth Party Congress will be remembered as one of the most important geopolitical events since the fall of the Soviet Union. The reason? As the U.S. retreats under Trump, China is setting international standards in more ways than ever before. Trade and investment. No country today has developed as effective a global trade and investment strategy as Beijing. China is writing checks and creating a global architecture while others are thinking locally or bilaterally. This model generates both interest and imitators, with governments across Asia, Africa, the Middle East, and even Latin America tacking more toward Beijing’s policy preferences because the direct transactional consequences have become much more impactful. Technology. China and the U.S. are leading the charge on investment in new technology—in artificial intelligence (AI), in particular. For the U.S., leadership comes from the private sector. In China, it comes from the state, which aligns with the country’s most powerful companies and institutions, and works to ensure the population is more in tune with what the state wants. That’s a powerful stabilizing force for the authoritarian and state capitalist Chinese government. Other governments will find the model compelling, especially those most worried about potential social unrest within their borders. And China’s economic clout will align tech sectors within smaller nations with Chinese standards and firms. Values. The only political value that China exports is the principle of non-interference in other countries’ affairs. That’s attractive for governments that are used to Western demands for political and economic reform in exchange for financial help. With the advent of Trump’s “America First” foreign policy and the many distractions for Europe’s leaders, there is no counter to China’s non-values-driven approach to commerce and diplomacy. 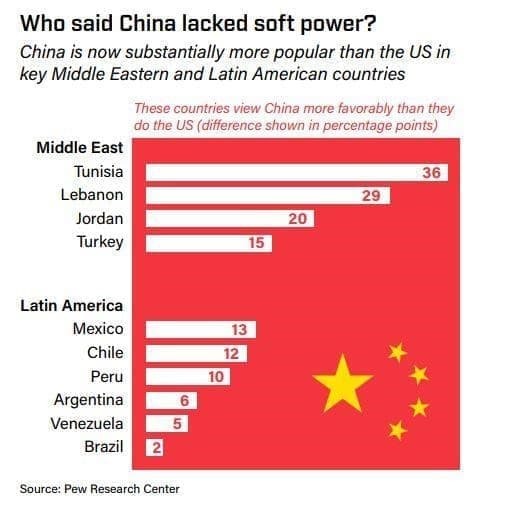 But importantly, China is still a regional power when it comes to national security. China has not been a player in the war against terrorism. And US defense spending is far greater than China’s. But in time, this may begin to change as China’s military becomes increasingly active in the Pacific. Cyberattacks. The risk of a major cyberattack has risen at a time when international mistrust and the erosion of common norms, standards, and architecture has made it more difficult to coordinate responses to attacks when they occur. That makes the risk of overreaction high, even when reaction is warranted. The threat comes both from states (Russia, China, North Korea) and non-state actors (such as Anonymous); the capacity to wreak havoc is rapidly growing, especially given security vulnerabilities and high-level leaks from within the U.S. National Security Agency. The prospect today of an economy-shaking cyberattack is real— be it via the destruction of a critical piece of infrastructure or through forced transparency that cripples the credibility of a leading corporation, bank, or marketplace; or even a takedown of the internet itself (several states have reportedly probed the resilience of the internet’s backbone infrastructure). If an actor goes after these targets, we’re in uncharted territory. Of all the unexpected geopolitical “accidents” listed here, cyber deserves to be at the top of the list. North Korea. The world’s most obvious risk of geopolitical accident. An unsatisfactory (and eroding) status quo remains the most likely outcome in 2018. Everyone knows that the US has only unpalatable military options. The North Koreans aren’t suicidal; further North Korean missile tests are likely, but a direct strike on an adversary is nearly inconceivable. Yet, rocket tests over Japanese territory are intrinsically dangerous and could provoke an escalatory response. So too the expanded military exercises and overflight by the North Koreans, Americans, and allies within easy shooting range of one another. Elevated tensions combined with less trust/coordination among all actors means that mistakes, when they occur, are more likely to ignite a conflagration. The possibility of war, which would risk severe damage to a key US ally and impact global supply chains, remains unlikely. But it’s much more thinkable today than it has ever been. Syria. The war in Syria will continue to wind down in 2018, but there will still be plenty of destructive hardware in the field carried by actors in close proximity who don’t like or trust one another. Russian and US bombers regularly fly into each other’s demarcation zones, and strikes in the wrong place could kill U.S. or Russian troops. U.S. soldiers are embedded with Kurdish forces around Raqqa and other areas east of the Euphrates, and they could become a target for Russia and Iran. It’s the Washington-Tehran relationship that’s most dangerous in Syria. Trump wants Iran out of the country. Terrorism. Conventional terrorist attacks continue to be far more likely, and dangerous, in the Middle East, North Africa, and South/Southeast Asia than in the developed world. But the end of the caliphate in Iraq and Syria has pushed many foreign fighters back to their homelands, creating increased risk in Europe, and the online sophistication of the Islamic State has facilitated more copycat attacks. A catastrophic attack in the US remains unlikely. The convergence of AI, big data and high-speed networks will help usher in the next technological revolution. Also, as the epicenter of progress shifts away from Silicon Valley, the race to develop the best and most productive technology could quickly fracture along national lines. It could easily become another arena for the U.S. vs. China dynamic to unfurl. A race for breakthrough technology is underway between the U.S. and China. Both countries’ tech giants are speeding to master AI and supercomputing among other highly investment-intensive, next generation technologies. The winner could well dominate the coming decades, both economically and geopolitically. A struggle for market dominance will continue to rage in third-party countries and regions that will have to decide whose products and standards to embrace. Think Africa, India, Brazil, and even Europe. China and the US are engaged in a global competition to be the lead technology supplier for their various international partners. 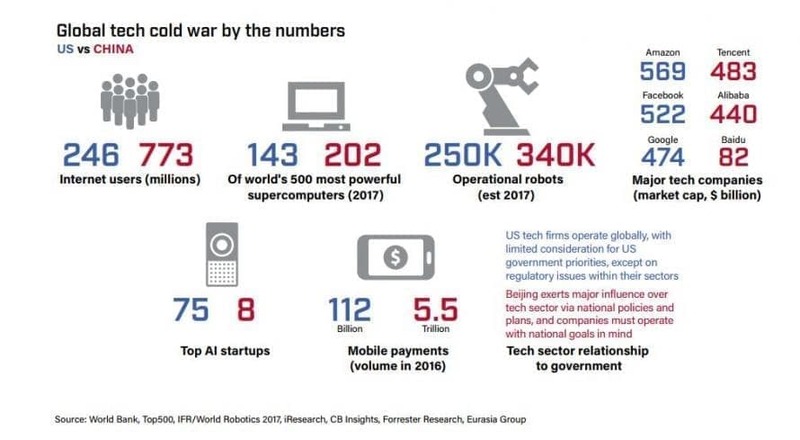 This fight plays out in three areas: civilian infrastructure (from fiber-optic cabling to cloud storage), in consumer goods (putting next generation smartphones in every hand), and in government procurement and security equipment. The latter is of utmost importance, as—just like the traditional arms deals of yesteryear—a linkup between two governments on cybersecurity creates long-lasting technical dependencies that translate into strong political ties. A successful NAFTA renegotiation in 2018 is still possible. Trump would probably hesitate to act on his threat to initiate withdrawal from the deal; even if he does, this would be a ploy to enhance US leverage in future negotiations rather than an attempt to destroy the agreement. Unfortunately, that’s where the good news stops. Renegotiation of the 23-year-old deal started last August and dominated the second half of the year, with scant results. If there is no deal or if Trump initiates a withdrawal process, this would not mark the end of NAFTA, but it would put an end to negotiations. Canada and Mexico would, at least initially, walk away, creating uncertainty over billions of dollars of economic activity in the world’s most prosperous region. Though the pain would be shared, the Mexican economy and those who invest in it would suffer disproportionately, given the country’s deep reliance on trade with the US. 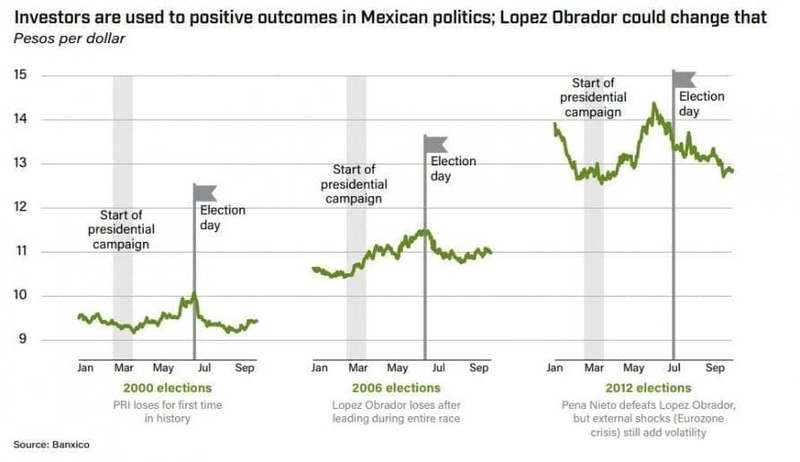 Meanwhile, the whole process could hit a wall once the Mexican presidential race starts in March. The campaign’s frontrunner is Andres Manuel Lopez Obrador, known as AMLO, who offers anti-US rhetoric and a statist economic policy platform. As Iran struggles with the largest wave of civil unrest in years as citizens take to the streets to express their discontent with the country’s languishing economy, there’s a very real chance that the Iran nuclear accord – known as the JCPOA – might not last the year. If the nuclear agreement collapses, the U.S. and Iran enter a new and dangerous geopolitical dynamic. Regarding sanctions relief and Iran’s nuclear program, two scenarios are possible, according to Bremmer: In the most likely, vigorous U.S. enforcement of secondary sanctions forces most European and Japanese companies to leave Iran. Oil importers in Europe, South Korea, and Japan decide against purchasing Iranian oil. But China and India would not acquiesce to a U.S. demand to significantly reduce their imports. If Iran offers both buyers a significant discount, about 300,000 barrels per day would probably come off the market. Iran would ramp up its nuclear program. It would at least break the seals on its advanced centrifuges currently in storage and begin large-scale experimentation and production on more-advanced models. The threat of US and/or Israeli strikes would again hang over the region and boost oil prices. In a less-likely scenario, Europe, Russia, and China agree to a “JCPOA 2.0” with Iran. While the pace of foreign investment would slow, firms already established in Iran would stay and others would eventually join them. European and Asian importers continue purchasing Iranian oil. Iran continues to comply with the JCPOA’s nuclear limits. Even the strongest institutions will erode over time if nothing is done to maintain them. Across the developed world (with the notable exception of Japan), popular trust in technocratic-bureaucratic institutions has declined, in some instances as a result of direct political interference in their work. And so most of the advanced industrial democracies - those countries on the top right side of the “J Curve” (describing the relationship between stability and openness) - are starting to edge down to the left. This will be an important global story in 2018. In the UK, there is criticism of “remainers talking the country down” by fighting over the terms of Brexit. In the US, partisan attacks on the non-partisan Congressional Budget Office have become commonplace. Greek courts found the former head of the statistical office guilty of insubordination and breach of duty for revealing the true size of the country’s deficits. In the US, the legitimacy of the mainstream media has dramatically decreased. Much of the public now believes that reporting is habitually “politicized,” feeding the growth of conspiracy theories and political movements that previous generations would have considered unacceptable. This will present the greatest risk in countries with already weak institutions (i.e. Venezuela). But even in the US, these trends are beginning to erode public trust in the intelligence community and regulators, which could have repercussions for the market and investment. Governments aren’t just trying to protect comparative advantages in traditional sectors such as agriculture, metals, chemicals, and machinery out of concern for lost jobs or domestic economic interests. They’re also intervening in the digital economy and innovation-intensive industries as protecting intellectual property becomes an increasingly important priority. But instead of traditional measures such as import tariffs and quotas, today’s tools of choice include “behind-the-border” measures such as bailouts, subsidies, and “buy local” requirements designed to bolster domestic companies and industries. 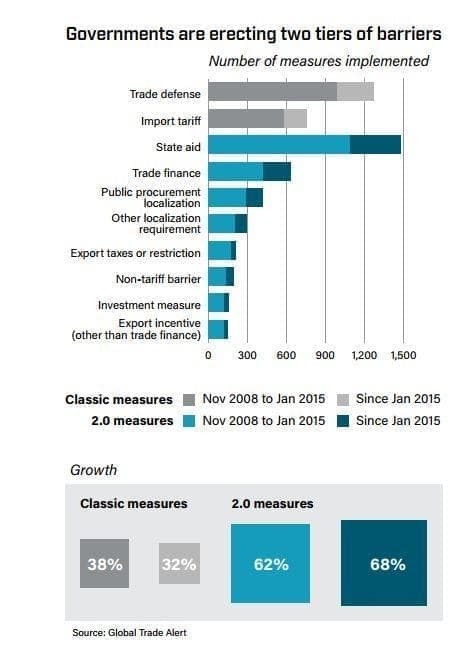 These measures don’t necessarily circumvent WTO commitments; they rely on a collective inability to update and strengthen existing global trade rules. And because this new protectionism will coexist with a continuing push for regional free trade agreements, the global regulatory environment will become more complex and contradictory. Companies and investors will have to manage more complicated supply chains and navigate more restrictions to data flows and other barely discernable or invisible barriers. The cost of doing business will rise, and supply chains will be less reliable. Consumers will bear the brunt of losses. Acrimonious Brexit negotiations and tumultuous domestic politics will make 2018 another difficult year for the UK. December’s deal to move Article 50 negotiations from divorce issues to those concerning future relations won’t lead to smooth sailing for Prime Minister Theresa May. The issues that must now be negotiated are too complex and the politics too divisive. On the question of British leadership, May will probably retain the premiership in 2018, but her management of the Brexit process could cost her the job. 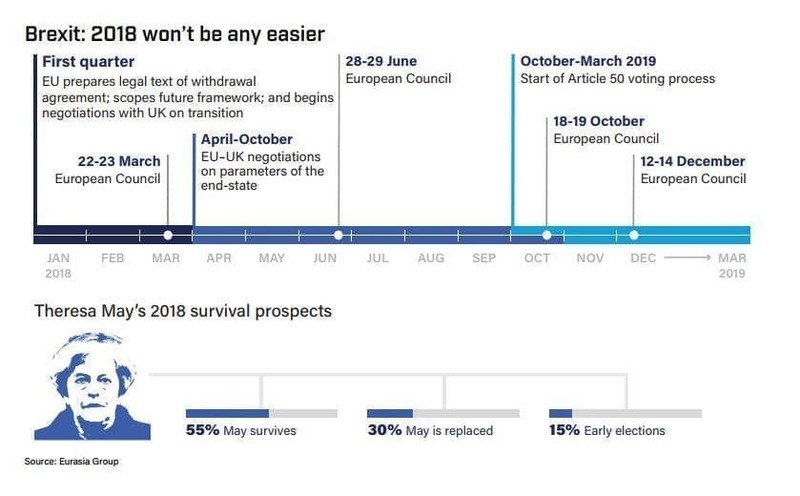 There are two: The prime minister could lose her job over her management of the Brexit process possible scenarios if she goes—both market negative. In the more benign, May would be replaced by a more hardline Tory figure through a sort of palace coup. This would significantly complicate Article 50 negotiations. The more negative scenario is a new election that leads to Labour Party leader Jeremy Corbyn replacing May. This would hurt both Article 50 negotiations and domestic economic policy.